Discussion in 'Change Log' started by Drui, Oct 23, 2018. You absolutely must begin with a source of power, an assembler, a refinery and a full set of tools. That's not entirely accurate... 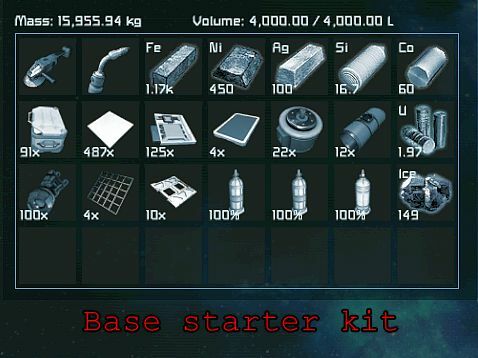 I developed a recipe* for the purposes of using any planet lander to start a base in space above each planet without having to gather any resources on the planet other than from the lander. It is even possible to do it with the lander still in the hover at it's maximum stable height and let the lander eventually fall or despawn. * For game/server with the common 10x inventory multiplier. Or else we could use the parachute drop feature and provide the beginner with the option to do an emergency call and a box with basic survival equipment will be sent down to him. @Roxette - This may be true, but that's just another example of what I'm talking about. In your scenario, what if I have no uranium? The reactor and assembler are not enough. Or what if I need nickel but the object I was supposed to grind down is destroyed by a meteor or a bad landing? It's odd how once you have everything, SE is a very casual experience with little in the way of danger or external challenges to solve. But toss out your grinder and suddenly it may be impossible to actually play the game at all. You could have an entire base with oxygen, power and refining, but if you have no grinder and no silicon, you could end up unable to do anything but stare at it. It's not exactly easy to get into that situation, a lot generally has to go wrong, but it's also far from impossible. There's a lot of defenses that could be made: don't build that way, be more careful, etc... but what it comes down to is there are soft-failure states in SE and it would be nice to see either a in-game way to avoid that, or for the game to acknowledge when it's happened. If it's a bug in Nvidia drivers or code dependent upon them, does that count as a hardware issue ? Because I've seen a few of those. Well, hardware or hardware drivers, yeah. в 1.187 начал новую игру. Не нужно новую игру начинать в 1.188? keen, you forgot to update the servers too ? Hmm, not seeing an ore detector fix unfortunately. Got pretty excited when I saw the update downloading. That one is a bigger deal that I originally though it would be. All the bug reports are still in "Under Consideration" so I'm a little worried we'll be waiting for the next Major for a fix to this. There doesn't appear to be a workaround either - all the modded Ore Scanners I've found to date just use the in-game mechanism with longer ranges etc. You can sometimes get clues from the low-LOD asteroids and planet models when you're at a distance - works for the more brightly coloured ores such as gold and cobalt but no good for silver, platinum etc. For planetary resources, any old GPS tags you have from old games still work, but with the new asteroid model space based resources won't be there. You can also modify asteroids so they're permanent, save the game locally (if the server allows it), then load it into SE Toolbox to see if it's worth looking further but that's way too tedious to be a proper workaround. If anyone knows of a modded ore detector that works via other means or has another workaround I'm all ears! There was a update today a small one but it would be nice to have the details added to the front page of this thread please? I don't think Keen use this forum for anything any more - have you checked their arsebook or twatter pages ? *After another reload ships power is now updating. Imagine that.... another update.... followed by a bunch of broken features. At least Keen is consistent. Imagine if they actually had a team of more than two or three people working on this game... it probably wouldn't even load. Five years since "Early Access".... five years of same things... add features... break others... Fix broken features at the cost of creating new problems. FIVE YEARS.... think about how long that is... and yet they still don't have a formula for not breaking the game when they create an update. Maybe time to hire some new blood? Old blood don't seem to get it. Or it won't. Game relaeased already but the issues are still there. Now the sloped glass is fully airtight so u can make an airtight enterance to your ship with 4 slope glass blocks only. Almost like Empyrion where was no airtight edges, only airtight/nonairtight blocks. Most probably this is not an easy task to complete and/or this is not priority. At this moment this exploit isn't an issue for me, andI still believe We will laugh of it some day .